I was at Quilt Market in Kansas in May. While there I filmed for Quilter's Newsletter Television. 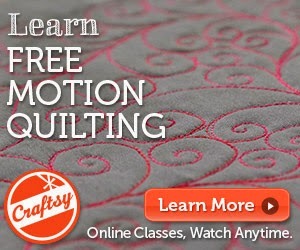 I showed them how to use the Handi Quilter Sweet Sixteen with TruStitch. I taught in a quilt shop in Moscow today. It is one of the largest and brightest quilt shops I have ever been in -- and it is underground! That was only one small part of the store. My Russian is getting better (as in I know over 20 words now), but I still cannot read anything but "Restaurant" (PECTOPAH), My translator told me what the above sign said. All kidding aside -- is it OK to confess that I teared up when I walked into Red Square? I have no emotional attachment to the place, but it was so beautiful and it was so incredible that I was actually there! I am a simple gal from a humble home and never did I ever dream that going to Russia would be possible. Florida, yes. Paris, maybe. Russia, no. I am so incredibly grateful to be here. I am staying in an amazingly gorgeous hotel. I am in one of the smaller rooms here. It is modest in size, but beautifully appointed. I am in love with Russia. Two pies for lunch -- meat and black berry. A translator and new friend Barbara (sounds like Vavara). She likes pie too! I am heading out to teach day 3 in St. Petersburg. Tonight I will catch a train to Moscow and teach there tomorrow. Such adventures! I taught today and had so. much. fun!!! Teaching through an interpreter was much easier than I expected it to be. I speak about 10 words of Russian and most students spoke about that much English. A few students spoke more, some spoke none at all. We understood each other fine for most things even without the interpreter. Maybe this NY gal can really talk with her hands? Using an interpreter, one of my students thanked me for my youTube videos. She said that she practiced and learned the patterns by watching the videos. My heart soared! She is apparently a subscriber to channel: debbybrownquilts if you are interested in subscribing too. After work tonight, we took a cruise on the River Neva. The tour guide spoke in Russian so I have no idea what happened where on which date, but the buildings?.... heavenly! I took a lot of photos until my camera lens got wet; it is raining pretty steadily here and is supposed to continue to do so. What do you think they sell in this shop? I am now a member of the borscht-eating public. It was rather delicious -- who knew?!?! It is midnight here and the sun just set. It is time for some sleep before tomorrow's adventures! I left my house at 9am Saturday and touched down in St. Petersburg, Russia at 5:30 pm Sunday. I am really tired and have not seen much (any!) of the city yet, but I m still surrounded by new things. The electricity in my room works very differently than anything I have ever seen before. I think all American parents want this system for their house. There is a slot for the room key near the door. If the room key is not in the slot, the electricity is not working -- no lights at all and no air conditioning either. When I leave my room and take my room key with me, I automatically turn off all of the lights. Everything will be just fine now! We enjoyed our safari immensely. Someone must have told him that I had bread. Maybe the duck wanted to eat the Frog-pole? At night, we were introduced to the Virginia State Bird -- the barking tree frog. How can something this small be so incredibly loud? I would love to go to Williamsburg again, but probably not in July.